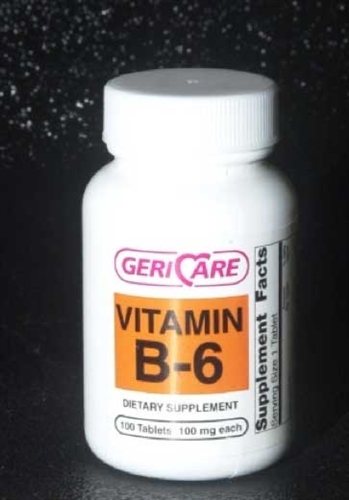 Geri Care Vitamin B-6 100 mg Tablets come in a bottle of 100. Other Ingredients: Lactose, Cellulose, Sodium Bicarbonate, Stearic Acid, Croscarmellose Sodium. May also contain Rice Powder, Calcium Phosphate, Magnesium Stearate. Directions: Adults - One tablet daily as a dietary supplement, or as recommended by your physician. As with any supplement, if you are pregnant, nursing, or taking medicationconsult your doctor before use. KEEP OUT OF REACH OF CHILDREN. In case of accidental overdose get medical help or contact poison control immediately.